While documentary filmmakers are having a field day producing a slew of left-leaning films, few 'regular' filmmakers have done the same. It's no surprise that of the few, one of them is John Sayles. Sayles (Casa de los Babys, Sunshine State) makes lots of movies, and in many of them his voice comes out loud and clear. Silver City is his comments on the upcoming election and the political process in general, but this time Sayles bit off more than he could chew. He tries to touch upon too many subjects, and in the process, loses himself in the details. The interesting mixes with the dull, and Sayles's voice becomes lost in the jumble. He would have done better by focusing on one or two stories and trimming a lot of filler from the film. 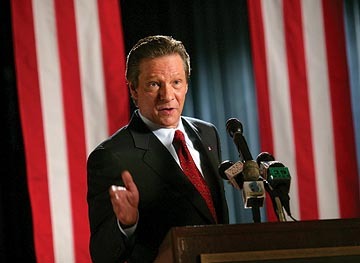 At the center of Silver City is Dickie Pilager (Chris Cooper, The Bourne Supremacy, Seabiscuit), candidate for governor of Colorado. Pilager is clearly modeled off George Bush, and Cooper's impression is dead-on. Pilager is portrayed as a simple man who cares little for details. He is part of a political dynasty, and his advisors, particularly Chuck Raven (Richard Dreyfuss, Who Is Cletus Tout?, The Crew). Raven takes charge when they discover a dead body in a lake. 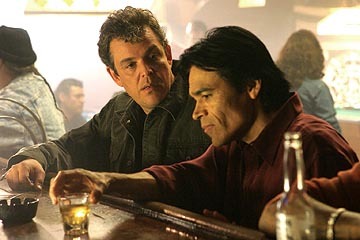 Raven hires investigator Danny O'Brien (Danny Huston, 21 Grams, Hotel), and O'Brien's story takes up the bulk of Silver City. Sayles is showing the complexity and corruption in politics by having O'Brien look into Pilager's enemies and anybody else who may have a beef with him. Things coalesce a little too slowly. Eventually, things point to a large corporation with lots of local influence pulling the strings. Many believe that Wes Benteen (Kris Kristofferson Blade II, D-Tox) and his company have the real power, and O'Brien thinks that they are somehow connected to the story. But Sayles has O'Brien take a bunch of detours including Pilager's nymphomaniac archer sister (Daryl Hannah, Kill Bill Vol. 2, Casa de los Babys), a tabloid internet site run by a friend (Tim Roth, The Musketeer, Planet of the Apes), and some personal soul searching with his ex-girlfriend (Maria Bello, Secret Window, The Cooler). O'Brien also has some skeletons in his closet, and this allows Sayles to touch upon journalism. O'Brien is the centerpiece of Silver City when Pilager should be. Worse, O'Brien is not too interesting. The most interesting character is Tony Guerra (Sal Lopez, The Banger Sisters, Gabriela), the man O'Brien hires to help him investigate. This may be because of everybody, Guerra has no checkered past, and has a sunny disposition about him that is different than everybody else in the film. The brunt of the film slowly moves from politics to O'Brien's investigation, which dilutes Sayles' messages even further. Moreover, the film does not invest enough time with any one character in order to establish some connection with the viewer. Because of this, Silver City always feels distant, and it's hard to get 'into' it, which is not good for a movie this long. 2 hours, 9 minutes, Rated R for language.